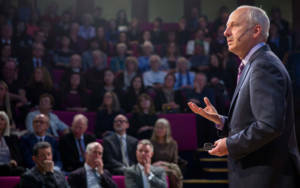 The Rothschild Foundation has supported a public lecture in conjunction with the Royal Academy given by Professor Michael Sandel titled ‘What Money Can’t Buy’. Is money the measure of all value, or are there some things money can’t buy? Renowned political philosopher Professor Michael Sandel considers the role that money and markets play in society and provides a lively philosophical discussion touching on art, democracy, and the meaning of a good life. In recent decades, market values have impinged on almost every aspect of life – medicine, education, government, law, art. But are there spheres of life that markets do not honour and money cannot buy? What are the moral limits of markets? Internationally acclaimed philosopher Professor Michael Sandel examines one of the biggest ethical questions in our time.Sandel teaches political philosophy at Harvard University and has lectured across the globe, including the Tanner Lectures on Human Values at Oxford and the Reith Lectures on BBC Radio 4. Sandel’s books include What Money Can’t Buy: The Moral Limits of Markets and Justice: What’s the Right Thing to Do? and his writings have been translated into 27 languages. He has been described as “the most relevant living philosopher,” (Newsweek) and “currently the most popular professor in the world.”(Die Zeit).